Greek-Canadian Alexia Antonio has won the title of Miss Teenage Toronto, so now she is off to the next competition — as a Finalist for Miss Teenage Canada which is taking place on August 13, 2017! 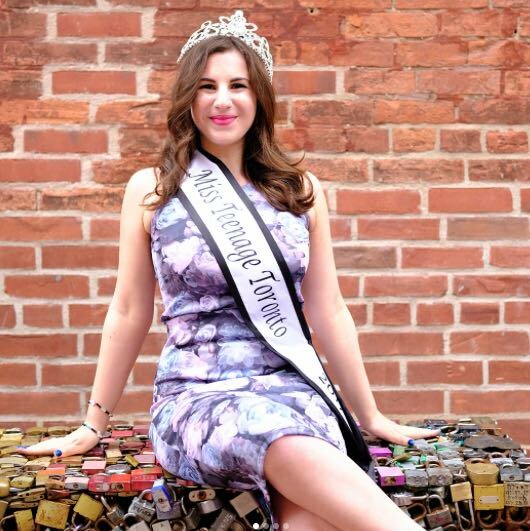 Alexia is the epitome of Miss Teenage Toronto as she has been working in partnership fundraising for the Canadian Breast Cancer Foundation and has taken on raising awareness of many difficult social topics involving female empowerment. “As Miss Teenage Toronto 2017 I aim to increase awareness and raise money for research for the fight against breast cancer. I would like to empower women going through the toughest battle of [their] lives; to give them strength; to give all women strength; to encourage women to support other women; to be united; to be confident; to never give up; to believe; TO BE FEARLESS,” Alexia wrote on her Miss Teenage Toronto blog. Alexia is carrying over her passions for volunteering and empowering others to her social platform for the upcoming pageant by fundraising for WE Charity called “Free the Children.” Her platform promotes her “Beauty Inside Campaign” which focuses on helping to empower women and children in need. She has even set up a crowd fundraising page on gofundme.com for WE Charity — Free the Children. You can help Alexia reach her goal of fundraising $2,000 by visiting her gofundme page here. For each donation that you make you will be entered into Miss Teenage Toronto’s Draw and 100% of all proceeds will go to WE: Free The Children Charity.